Herculaneum V.31. Casa del Sacello di legno or House of wooden shrine. House of Lucius Autronius Euthymius? Excavated 1933-34. The seal of Lucius Autronius Euthymius was found in this house. 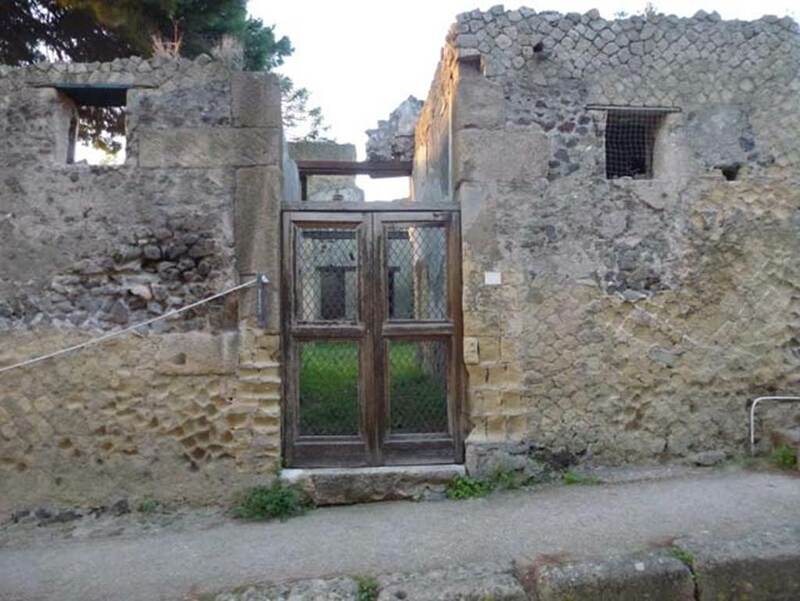 According to Maiuri, this house with a long narrow floor-plan and a humble aspect still preserved the original distribution of rooms and traces of the more ancient decoration of a small house of the Republican era at Herculaneum. Above the tablinum there are the truncated shafts of the columns of an upper gallery like those in the Samnite House. In a cubiculum on the upper floor, many wax tablets were found, some of them in a casket, others heaped together under a bed. Unfortunately, their condition made it impossible to read and interpret them. On one side behind the tablinum, there is an oecus with the remains on the upper part of the wall of good decoration in the I style, and in the III style on the lower walls; on the other side behind the tablinum is a store-room, where many terracotta dolium covers were found. See Maiuri, Amedeo, (1977). Herculaneum. 7th English ed, of Guide books to the Museums Galleries and Monuments of Italy, No.53 (p.51). V.31 Herculaneum, October 2012. Looking west to entrance doorway. Photo courtesy of Michael Binns. Room 1. Room on left of entrance, south of it - stairs to upper floor above rooms 1, 2 and entrance corridor, with balcony jutting out over cardo V.
In one of the upper rooms, a wooden cupboard was discovered, inside it was an archive of wax tablets and some paper documents. Room 2, cubiculum on right of entrance corridor in which was found a wooden cupboard-lararium in the form of a temple with Corinthian capitals above, and a cupboard closed by doors with two shutters, inside containing terracotta lamps, glass jars, and other household items, a bronze statue of Hercules, an unrecognisable female deity, and a bronze seal bearing the inscription of L. Autroni Euthymi (Lucius Autronius Euthymius) which may give back to us the name of the last owner or tenant of the house. Room 3, tablinum, made smaller by the making of the corridor on its south side. The south wall of the corridor would have been the south wall of the tablinum, with I Style decorations. Windows were added into the west wall to give light to the rear rooms, which may have taken the place of the garden area. On the north side of it are stairs to upper floor, leading to a cenaculum (a columned loggia) and other upper rooms. Room 4, cubiculum on south-west corner of atrium, next to corridor, separating it from room 3, the tablinum. Room 6, a corridor, at the rear of which was a latrine. In an upstairs room, a large number of wax tablets with illegible writing were found under a bed. If they had been in a wooden cupboard, they may have been better protected and survived. The owner of the house was Lucius Autronius Euthymius; his seal survived. See Deiss, Joseph Jey, 1968: Herculaneum, a city returns to the sun. London, The History Book Shop, (p.90-91). According to Cooley, one group of wax tablets was uncovered in a wooden cupboard in a cubiculum on an upper floor here, while another group was found in the same room in a chest under the bed. V.31 Herculaneum, September 2016. 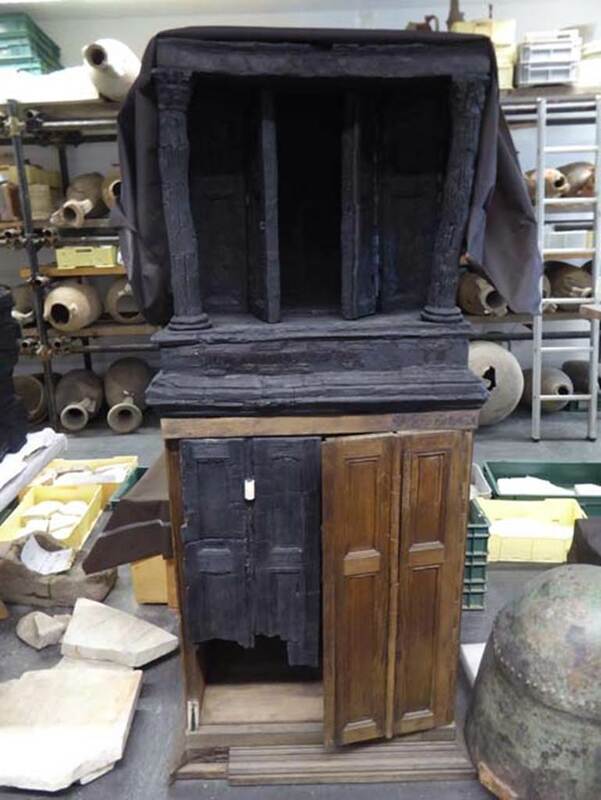 Wooden cupboard, with its upper part in the form of a tiny temple. 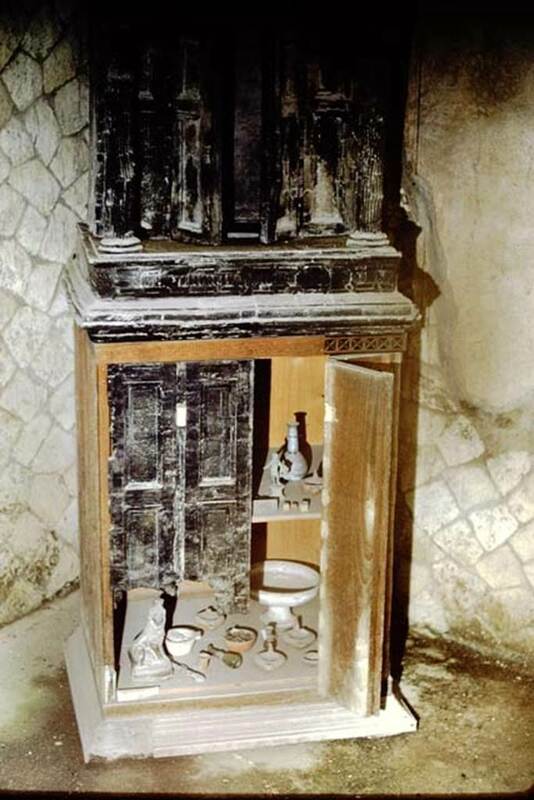 This was found in Room 2 in 1934, the room on the right of the entrance corridor. V.31 Herculaneum, September 2016. 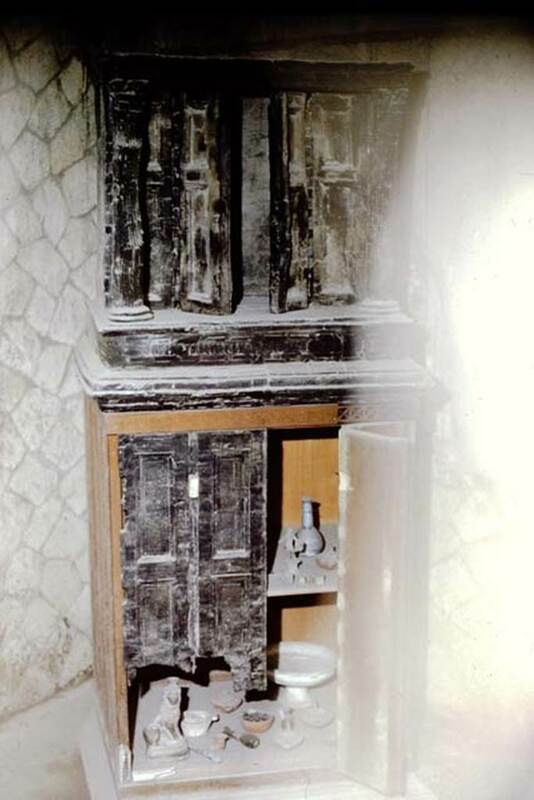 Detail of upper part of wooden cupboard, in the form of a tiny temple. This was found in Room 2, the room on the right of the entrance corridor. 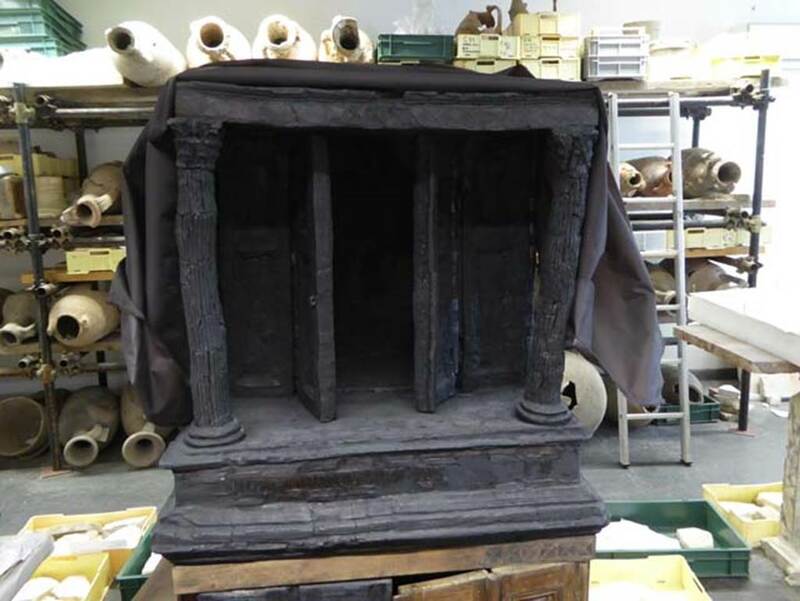 Wooden lararium with marble capitals with wooden cupboard below.